Every single factor, no matter how large or how small, must be taken into account when modeling a scenario or event—even the unknowns. The presence or absence of even a single detail can dramatically alter eventual outcomes. 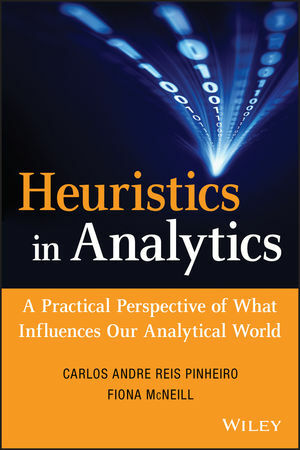 From raw data to final report, Heuristics in Analytics contains the information analysts need to improve accuracy, and ultimately, predictive, and descriptive power. CARLOS ANDRE REIS PINHEIRO is Visiting Professor at KU Leuven, Belgium. He headed the Analytical Lab at Oi in Brazil, one of the largest telecommunications companies in Latin America. Pinheiro has conducted Postdoctoral Research at Katholieke Universiteit Leuven, Belgium, Université de Savoie, France and Dublin City University, Ireland. He holds a PhD in Engineering from Federal University of Rio de Janeiro, Brazil. He worked at Brazil Telecom for almost ten years and also accomplished postdoctoral research at IMPA, Brazil, one of the most prestigious mathematical institutions in the world. He has published several papers in international journals and conferences and has four books (all in Portuguese) that focus on the internet, database, web warehousing, and analytical intelligence. He is the author of Social Network Analysis in Telecommunications, published by Wiley. Next story A/B Testing is not art, it is science.